You can be proud! Here is the news that you have all been waiting for! We are thrilled to announce the fabulous news that 68% of our scholarship students in Hampaté Bâ Middle School succeeded in obtaining the BEPC Diploma in July 2018. This is an incredible score as compared to the national average of 55%, especially for students like the ones we support, coming from very underprivileged backgrounds. 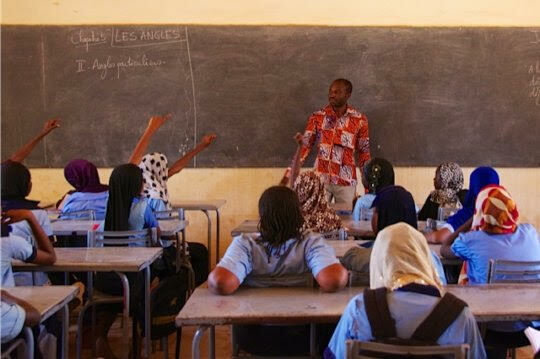 The BEPC is an important diploma in Niger as it gives students the right to graduate from Middle School and continue on to High School or qualify to attend one of the many Professional Training Institutes. Our students’ merit is indisputable as they worked hard constantly and made earnest efforts to get this diploma. It is indeed an amazing accomplishment for them, as the majority have illiterate parents and therefore no one to help them with their studies at home. In fact, a big part of their success story is due to the SPECIAL TUTORING PROGRAM that our Association put in place several years ago thanks to your donations. This program provides our scholarship students with a support system to study after school under the guidance of qualified tutors for major subjects like Maths, French and Physics/Chemistry. We have made sure that the number of students in these classes remains small, never more than 10 –15, allowing them to get individual attention and be able to ask questions and get answers! Without this tutoring opportunity, obtaining their diploma would have been much more difficult, and perhaps not possible at all. This project has evolved over time. We especially remarked last year that the students’ academic grade level increased noticeably each month and we believe it was a result of our tutoring program. How about some statistics as proof? The statistics are concrete: last year 87% of our scholarship students’ grades moved up between 2 & 5 points during the year in the subjects where tutoring was given. This was especially true of the students who regularly attended the tutoring classes. A student with 8/20 as an average at the beginning of the year, typically ended up with 10/20 and some even reached 13/20 at the end of the year. We checked this out with a total of 30 students, both weak and strong, and the survey showed a gain of significant points and an important rise in grades in the report cards of 27 students out of 30. Let’s backtrack ….Did we get good results right away at the start of the Tutoring Classes some years ago? Unfortunately not! In the beginning, very few students attended the classes, there was no roll call, and the students were clearly not motivated to stay after school, especially for subjects that were difficult for them. Gradually, the students recognized the worth of remediation tutoring in small classes with clear explanations, they suddenly began to understand the basics of difficult subjects, they felt comfortable with the specialized teachers who patiently persevered and promoted skills development in reading, writing and maths and they were proud to reply «here «to the roll call every single day. The high-level students felt penalized that they weren’t included in these classes, so a special class opened for them. A Taste of Success! The most convincing proof of this current enthusiasm is the revitalization of the Tutoring program which is helping to turn mentalities and beliefs around. 3eme Students (9th grade) are so impressed with the fruitful tutoring program, that INSTEAD OF STAYING ON VACATION, THEY HAVE REQUESTED TUTORING CLASSES THE WHOLE MONTH OF SEPTEMBER BEFORE GOING BACK TO SCHOOL IN OCTOBER in their two weakest subjects: Math & Physics, They want to get a head start for the BEPC exam in June. Focus is on improvement and understanding. Of course, we agreed! The Magic Wand of Mr. Gogo : Our Tutoring Program provides excellent pedagogues who encourage each student to improve and reach his potential, One tutor, in particular, Mr. Gogo has supported the students many years, has given them confidence, and found a way to motivate and inspire them in 2 very difficult subjects: Maths & Physics. In turn, the students’ curiosity stimulates him. « The students promised me I would be proud of their results on the BEPC and when they announced their success, they were jumping up and down and hugging each other » related Mr. Gogo concerning the successful BEPC results. « We learn, we succeed, we are proud of ourselves, it’s agreeable, it feels good, it’s fun, we want more ! » declared Aminatou, speaking of the tutoring. « I’m really good at Maths, but Physics is a mystery to me. In tutoring, we can ask many questions, and Mr. Gogo answers them and puts examples on the blackboard. We also correct all our tests afterwards with him. We wait every week for our Tutoring Class and love how he challenges us», remarks Fatimata. Your generosity and support in providing scholarships and private tutoring for these deserving, impoverished students have served a wonderful purpose and has made their dreams come true to get a quality education leading hopefully to a career of their choice! Please help us continue financing and extending more Tutoring Classes as this is an important key to their success and you can proudly feel you are making a difference. Parent engagement in school is nurtured when parents come to understand that their involvement in their child’s studies is a key part of what it means to be a responsible parent, when they are confident enough to make meaningful contributions to the school’s efforts and when they realize that the school administration and teachers, as well as their own children, value their participation in the school. Our organisation, “Les Amis de Hampaté Bâ”, has been encouraging our teachers and administration in Niamey to work more closely with parents in order to identify goals, problems, and potential solutions to create more successful partnerships to assist more students. During the first Parents/Teacher Meeting this week, the principal emphasized the importance of good health from a balanced diet and a hygienic environment that enables the students to work better. “Poor health and unhygienic environments are important underlying causes for absenteeism and poor academic performance,” he explained to the mothers and fathers present at the meeting. The teachers also asked parents to show more commitment towards supporting their children’s learning and treating learning as a priority. Almost all of the parents present at the meeting admitted NOT giving their children the time for study, homework, and other learning tasks at home. They also said they did NOT control time allowed to watch television, drink tea, chat with friends, and play cards at the expense of doing school work. Mothers recognised the fact that their daughters spent a lot of time helping them with housework. School work came second, and NOT first. Once again, the principal intervened asking the parents to provide their children with a suitable place to study at home and to monitor their study time. « These practices make your child understand that his/her academic success is a priority for you and that you put effort in monitoring progress towards this goal ». The meeting ended with parents thanking the school staff and our humanitarian association , for doing so much for their children. « We are very grateful to the school and Les Amis de Hampaté Bâ for taking such good care of our children. We have heard what the teachers and the principal have said and will try to give more of our time and attention to the school work of our children to help them be more successful in their studies and have a better chance in life », said a very happy father. Your donations help us promote a quality education for underprivileged students. Thank you! We are so proud of the progress our scholarship girls have made during their years at Hampate Ba Middle School and through the girl empowerment program we have sponsored. How exciting to see that some of these girls are on the threshold of starting high school now. Against all odds, thanks to « Les amis de Hampaté Bâ », and their own determination and hard work, Nabila and her friends have not only gone to school and stayed in school, but are amongst the strongest achievers, and, this fall, are starting Hampate Ba’s new high school which is opening in October ! 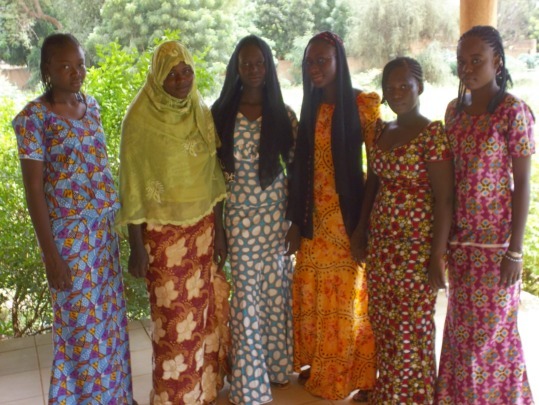 These girls still face challenges in the Nigerien society that their brothers do not, but they are all determined to continue their education, despite the barriers they face. They have gained confidence in themselves and have realized that girls and women are capable of accomplishing many jobs in society, especially with the support of a good education. This year, they will be receiving after school supplemental instruction in certain subjects to add to what they are learning in school. For the girls, this is instrumental for increased understanding of difficult subjects, such as chemistry, physics, mathematics, and French. Thank you so much for your faithful support! Because of you, these girls are in school as members of an academic community – trying to reach their educational goals and make their lives better! Your generosity has saved girls from early marriages and your contributions are making a big difference. We really thank you kindly for continuing your donations so these girls can continue their high school classes. How about helping them reach their dream and be part of our first graduating class in 2018 !!! Ready for high school ! Such great news for the school year 2015-2016 ! 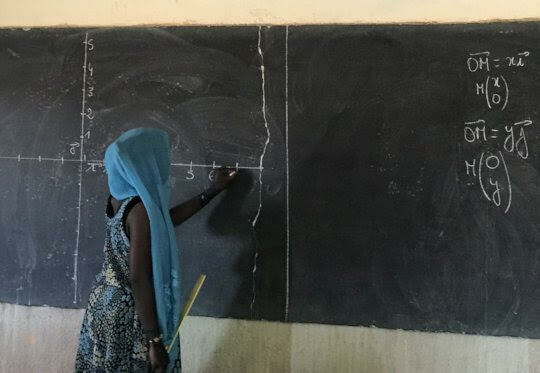 The Hampaté Bâ School has been approved by the Nigerien Ministry of Education to expand into a high school section and has welcomed its first class of 10th grade students this fall. How exciting is that ! At Hampaté Bâ High School, all students will be working towards obtaining their graduation diploma, regardless of their background. The teachers at the school talk about how students are climbing a mountain towards a high school diploma and, like any challenging expedition, getting there requires a lot of discipline and hard work. Indeed, there is lots of support to go along with the school’s high expectations. 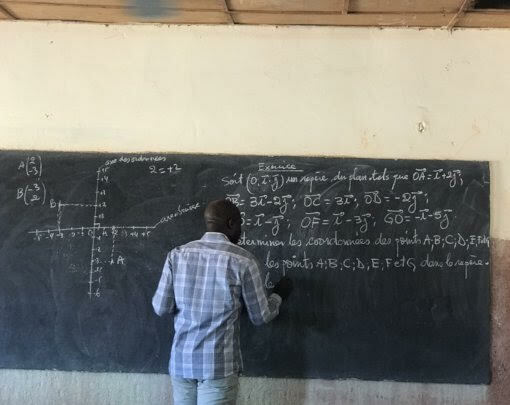 Thanks to your donations, students receive extra teaching time in numeracy and literacy, and next month, the remedial class teacher will take the new students to visit the Abdou Moumouni University in order to help them see what the summit of their mountain could look like. We truly appreciate your past participation and any help you can continue to give these students through your donations will allow them to get to the top of the mountain… a high school diploma leading to a university education. Please consider donating to make these dreams come true and through education, make our world a better place. Thank you so much. You are certainly making a big difference with your generosity! The small stone of your financial support is casting a wider and wider arc in the lives of students such as Aziz and Fatchima as they develop and flourish. Aziz has come a long way since he was first sponsored by our Association, les Amis de Hampaté Bâ, in 2011. When Aziz first came to Hampaté Bâ School in 6th grade, he was a bright and well behaved student, although very timid and shy. However, now he has matured into a confident young adolescent who has just received his BEPC (9th grade diploma). “The sponsorship has changed my life and I’m really looking forward to starting high school next year”, he says smiling. He is one of the deserving beneficiaries of your generosity and not only has he learned to read and write, but he has become a star student. The next academic year, he will enter high school. The first one in his family to do so! Our charity believes that education is the best foundation for building a better life for our students and the surrounding community. This is why we are dedicated to providing the opportunity of schooling and special tutoring classes to students like Aziz and Fatchima who are gifted and eager to learn, but are financially challenged. The more donors we have, the more we will be able to help underprivileged children get a quality education. We hope that generous donors around the world will join us in this great cause! Our organisation’s sponsorship programme is well into its fourth year of identifying high potential young people from disadvantaged backgrounds and giving them the opportunity to realise their potential in a school that is child-friendly and offers quality education. HUGE THANKS TO GUILLAUME FARLEY for a marvelous show Thursday night and for offering us many moments of joy and poetry... with reflections on love and life ! A superb evening with much applause for an extraordinary artist. Guillaume has heart and talent and those who were lucky enough to be there, know it !! 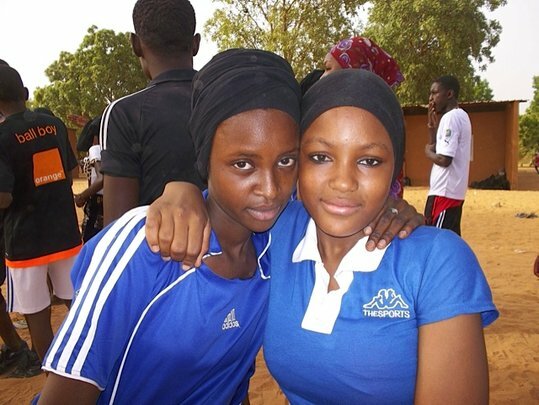 More girls in school in Niger thanks to tickets sold ! Thanks to all who came to support our worthy cause and enjoy Guillaume's show ! At Hampaté Bâ School we're proud that 50% of the students are girls - traditionally a vastly under represented group in education in Niger. Today, girls are recognised by the UN as important agents for change, possessing the potential to solve the most persistent development problems facing the African continent. 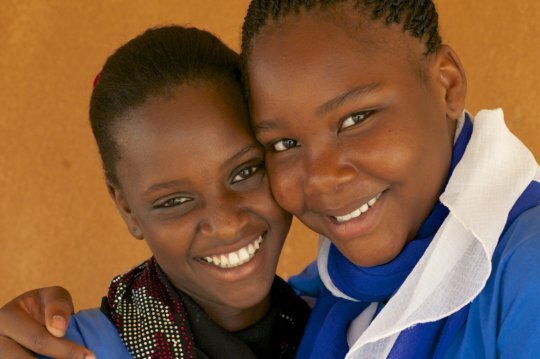 By investing in girls' economic potential through education - which can also delay child marriage and teen pregnancy - the cycle of poverty can be broken. Unfortunately however, girls are often the first to be withdrawn from school by families who require domestic support, or who cannot afford to send all their children to school. While our Association recognises these challenges, we're determined to keep as many girls at Hampaté Bâ School as possible and are actively tackling the issue to ensure they can continue their studies. One particular initiative is the introduction of the special 'Home Economics classes'. The aim is to fight barriers to education for girls and increase their chances of completing the education cycle. The Home Economics Program provides girls with a positive co-curricular opportunity enabling them to learn about female issues and even to share with their peers. Girls attending this class recently organised a school event to raise awareness of the importance of girls’ education through songs and dances. They also planned and implemented an outreach project in a nearby primary school where they spoke to all female students about menstruation and menstrual hygiene. We're extremely proud of all the girls and their teacher, Mrs Moussa, involved in this program and who are making this project a massive success. “ I’m proud of my girls and persuaded that the message that we are trying to get across to them, that they are not second class citizens, but full members of our society, will have a positive impact on their lives now and in the future”, says a very jovial Mrs Moussa. Our association is funding the Home Economics Teacher as well as paying scholarships for the girls to stay in school. We need to keep this project going! Believe in us, believe in the project, and believe in the teacher, the girls and their potential. We deeply appreciate you continuing to support this innovative project. Any amount is welcome. Thank you so much. Friday march 20th: come support us at the theater ! The Pamplemousse Company will give us the proceeds of tickets of people who see the play and mention « Les Amis de Hampaté Bâ» on the form ! Reserve your places clicking here! Project Report: A home run for Hachimou and Fourera ! The End of Year Recognition Ceremony at Hampaté Bâ School in Niamey is designed to highlight the outstanding work the students have accomplished in the areas of service, academics, arts, and leadership, while affirming the unique challenges and experiences they share. Two years ago, Hachimou and Fourera were struggling readers and writers !! And look at them now !! Throughout the year, the values of curiosity and participation have been the foundation for his success at Hampaté Bâ Middle school. He has been a model student and has developed a real interest in computing skills. Beyond learning, he is a polite and friendly pupil who always has a smile on his face. His enthusiasm rubs off on people around him. “The treatment at Hampaté Bâ School, in my opinion, is the best that we can get. We study in an environment where we are not scared or humiliated. Because of this, we are able to work well in an encouraging atmosphere. Besides the good learning conditions, I'm also very glad that I can learn computing skills at this school with great tools and special computer classes. Later on, I would like to specialize in computer programming." According to her teachers, Fourera has been an absolute pleasure to teach because of her positive attitude and approaching everything she does with joy. She works hard and as a consequence has made enormous progress in all domains since she joined Hampaté Bâ School. Fourera also always has a kind word for all of her classmates. She has been recognized for her progress in arts and her team spirit. "The Principal and the teachers try to instill certain values in us. One phrase that we constantly hear is : it is all about choice. We must learn to make the right choices. I have chosen to help my family financially and that is why I want to succeed in school." These are only a few examples of the progress being made at Hampate Ba School, thanks to your donations, helping young underprivileged students learn to read and write, to become literate and have the right to a quality education where they WANT to learn. As a result, we are preparing groundwork for them to become responsible citizens and future leaders. Not Only In School, But Learning Too ! 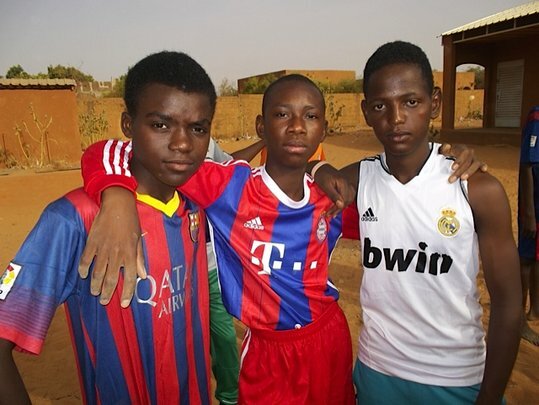 Many poor children in Niger never attend school and that is a distressing reality. But what is even more shocking is the fact that many of those who do go to school learn very little. 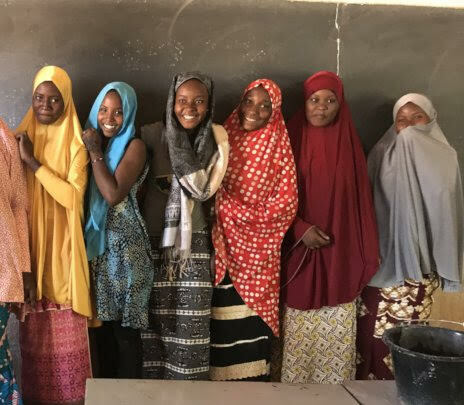 Under the current model of education, half of Niger's total primary school population reaches adolescence without the basic skills needed to lead successful and productive lives. As a consequence, the prognosis for Niger's future economic growth and social development is not very good. 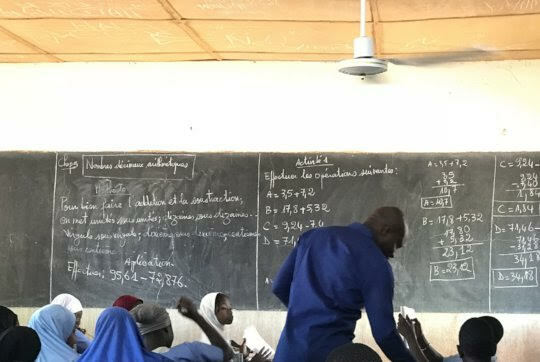 Hampaté Bâ Middle School is striving to address this deep learning crisis by raising teaching standards and improving learning outcomes, so as not to waste the potential of underprivileged Nigerien youth. This is by no means an easy task, but it can be done. At Hampaté Bâ , the students are not on the receiving end of a monotone recitation geared towards rote learning. Here, they actually understand what they learn. "Before coming to Hampaté Bâ, I used the word "century" a lot, but I never knew what it meant. Also, I did not know the difference between a country and a continent. Now I do", says proudly Abdou, a 7th grader in the school. Aminatou, a bright-eyed 13 year old girl, had this to say about learning at Hampaté Bâ : "Before coming to this school, I used to learn all of my lessons by heart without understanding much and my teachers were satisfied with that. Here, the teachers make sure we understand what we recite or what we write. So learning by heart is good, but not enough." 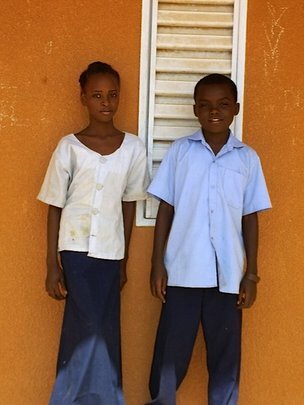 Thanks to your generosity, we can offer quality education to students like Abdou and Aminata who, in primary section, went through 6 years of zero value-added schooling. Now, they are not only in secondary school but learning ! 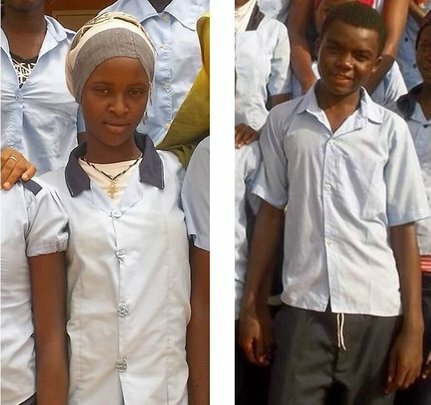 The ultimate aim of our association is to support Hampaté Bâ school in its efforts to equip underprivileged students like Abdou and Aminatou with the numeracy, literacy and wider skills that they need to realize their potential – and that their country, Niger, needs to generate jobs, innovation and economic growth. Please help us achieve this aim. Your donations really count !! Thank you.